Are you searching for up to 100% Hard Money Loans, up to 100% LTV hard money lenders, ARV Loans, or Hard Money Loans 100 Financing? If you are our team can help! Brad Loans by eMortgage specializes in hard money real estate lending. You can view our hard money loan rates along with our loan programs below. The hard money loan rates posted below are common, however your loan rates, terms and fees may vary as loans are approved and structured on a case by case basis. ALL LOANS REQUIRE $1920 IN FEES to eMortgage Inc. to cover Application fee, Underwriting, Loan Processing , Document Preparation and Lender Inspection . Borrower has option to pay “points” to buy the rate down by paying a Loan Origination fee of 2 to 6 points (2 to 6% of Loan Amount). 100% FINANCING AVAILABLE if borrower has an additional property that is free and clear or property that has significant positive equity (it’s worth considerably more than is still owed), it can be pledged as additional collateral (aka a Cross Collateralized Loan). We have no pre-payment penalties on loans. Down payment: 30% (Investor) or as low as 20% (Owner Occupied). Up to 100% financing with a 2nd free and clear property as additional collateral. 100% financing hard money loans with no money down are available with “cross-collateral”, where borrower allows the loan to be secured by equity in an additional, usually debt free and clear property. For example, there is a property you want to purchase for $100,000. You don’t want to dedicate the resources to the down payment or just don’t have it. You own another property that is worth $80,000 that is free and clear. You have $80,000 worth of equity. Brad Loans is able to loan you 100% of your purchase price (no money down) for the new property you are buying, as we would use both the property you are buying, as well as the property you already own, as collateral. You are pledging the equity in your additional collateral as additional security for your loan in lieu of putting up a cash down payment.The cost for this feature is a fee of $975. Loan doc preparation, Underwriting, Loan Processing, Lender Inspection, Application Fee. Does not include title fees, appraisal, or pre-paids. *Remember to set money aside for your title fees, escrow fees, pre-paids for 1st year insurance and initial deposit in to impound account for future taxes & insurance, account servicing set up fee, prorated interest, appraisal & other typical closing costs. These typical closing costs—separate from loan fees—usually add up to about $3500 or so. Monthly Payments to include 1/12 taxes and insurance + an estimated $30 account servicing fee to loan servicing agent (we currently use Evergreen Note Servicing). Tax Free and/or Tax Deferred Profits ! Use your 401(k) or IRA funds for a down payment and let BRADLOANS.COM finance the balance. Make 25% to 100% or more return on your down payment investment tax free or tax deferred. Example: you buy a home for $100,000, put $30,000 down, resell for $130,000, you made a $30,000 profit on your $30,000 investment, and best of all, your profits are tax deferred, or if in a ROTH 401(k) or ROTH IRA, your profits are tax free! (consult your tax advisor). As real estate investors ourselves we understand how competitive the market can be, and how getting a loan fast can make the difference. Our hard money loans make it easy for real estate investors to apply for a loan, get funding quickly, and overcome bad credit issues. This isn’t more true than when real estate investors are seeking a hard money loan for a fix and flip property. The loan can be short term, include the cost of renovations, and even not require a down payment with cross collateral. When purchasing properties for the purpose of fix and flipping them you can finance the cost of renovations into the loan. Up to 70% of renovation costs can be rolled into your loan on any of the loan programs above. The Cost for an ARV loan is $575 additional. Roll RENOVATION COSTS into your PURCHASE LOAN based on renovation cost and ARV (After Repair Value) appraisal. Renovation cost loans are done on a case by case basis. Below is an example to give you an idea of how it works. We release financed renovation costs upon completion of renovations. $70,000 purchase price + $30,000 estimated renovation = $100,000 total acquisition cost. $35,995 Total Cash out of pocket from Borrower to COE in this example. $70,000 BRAD LOAN is fully funded to title at close of escrow. $21,000 remaining loan proceeds HOLD-BACK in escrow RELEASED to borrower upon COMPLETION of renovations. Fill out our 5 minute ONLINE APPLICATION We will get back to you within 24 to 48 hours (often sooner) to discuss your BRADLOAN application. SPECIAL FINANCING on SUPER HOMES! See our Properties page for special lower interest rate loans, reduced down payment requirements, as well as extended terms on BRAD LOANS secured by our inventory of specially renovated Brad Homes. We have some excellent properties that have lower interest rate Seller Carry-back financing with no loan fees. Many of these homes are total upscale renovations and MOVE IN READY. Rates, terms and fees stated herein are for Real Estate and Mortgage Professional use only. As an example, a $200,000 loan at a 60% LTV at a rate of 8.99% amortized over 30 years has an APR of 9.932%. APR cannot be determined until loan costs, determined by the specific and various terms of a particular loan, are calculated in to the equation. All fees quoted herein for the numerous loan programs are typical estimated fees to demonstrate an example of various loan scenarios we may create for a borrower’s special needs. Actual fees and APR may vary due to specific circumstances. Rates, terms and fees listed herein are subject to change at any time without notice. 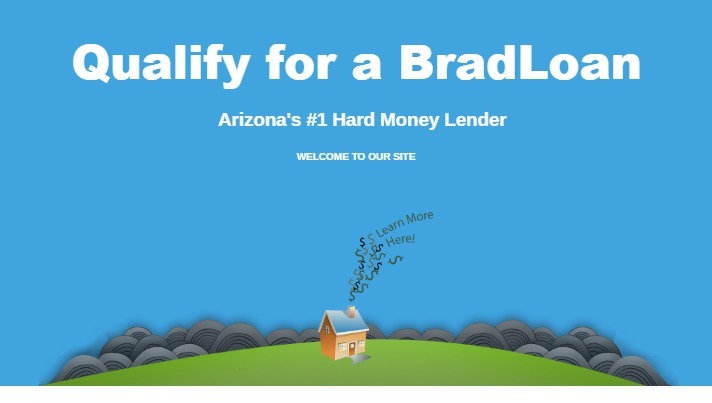 Brad Loans by eMortgage proudly offers the very best hard money loans in Arizona. We specialize in the Phoenix market and all of the cities surrounding it. If you’ve found a great real estate opportunity for you to buy and own or you’re a real estate investor, we can help! With the ability to work with bad credit, and up to 100% hard money loans we can help you get the funding you need. Best of all we get the job done faster than traditional lending, which gives you the buying edge in a competitive market! FILL OUT THE LOAN APPLICATION ON THIS WEBSITE. We will call you to let you know if you qualify. If you have questions or want to get started call today at 480-948-0880 to discuss your specific loan options with Brad and his team!